preview – Welcome to Spinksville! I have a theory that while female models in games pretty much started out based on underwear models and haven’t moved on significantly from there (depending on whether you think Sonic is female or not), graphic artists are now tending towards two male forms for all portrayals of men in games. 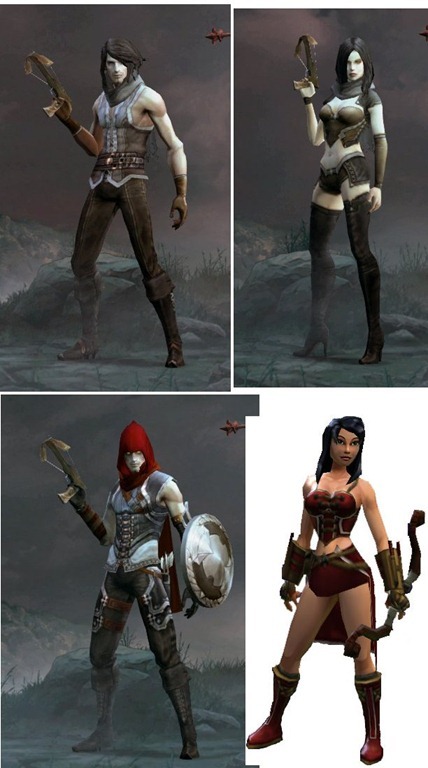 I think we should applaud this diversity, since some of us like our guys lithe and … err… assassiny. In fact, if Blizzard had only made their original male blood elf model look more like Ezio (which admittedly would have required a time machine since TBC was released first IIRC), I bet none of the beta testers would have whined about them looking gay. 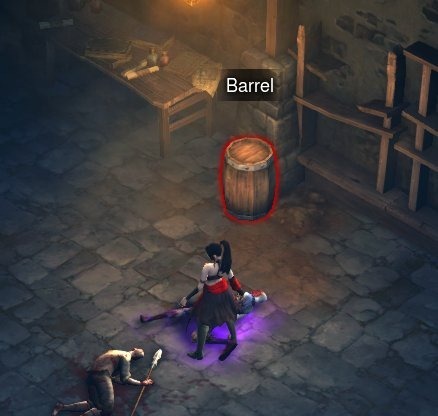 This is a roundabout way to introduce the topic of Diablo 3, which I have been playing some more this weekend as and when the servers allow it. So without more ado, this is the demon hunter. I am looking forwards to playing D3 at release, and have been making more of an effort to note any cool tweaks and updates to the genre that have impressed me particularly. I like the events that you encounter in the dungeons, they make a neat change to standard boss fights and I can see there’s lots of scope for Blizzard to add more of them as time goes on. The achievements work really well in Diablo also. I’m not an achievement minded person, but I was thinking about how to do some of them (like kill 20 mobs in one go) and which build would be best suited for it. There is plenty of scope for fun play there. It feels quite quaint that the characters are so non-customisable, and that the loot will tend to end up looking samish also. 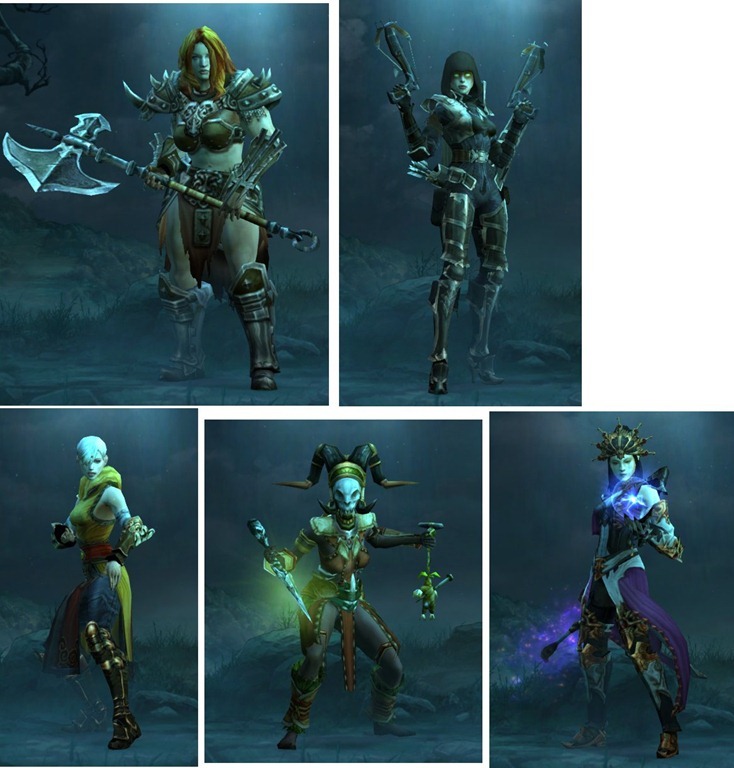 I assume unique items and sets will have different looks to them. I love how the game keeps track of your ‘high score’ for things like killing streaks on both mobs and destroyable items, and number of mobs killed in one blow even if you don’t hit the achievement. It gives a good sense for when you’re getting better. I like the voiced lore items and journal entries. I did encounter at least one lore item (skeleton I think) which was not voiced, which struck me as an unusual polish fail. The character voicing is not very good. Some of them are pretty terrible. Particularly the accents. I realise they may be the same actors as previous versions but they’re still not very good. But I feel less waspish about it now, because the male demon hunter sounds very cool. I am not one of the people who complains about lack of talent trees, I prefer not having to think too much about which abilities to take. And the beta only covers the first few levels so it’s a bit soon to judge how well anything is balanced. But this is also Diablo and mobs come at you in packs, so the classes with the better AEs are easier to play. Co-op groups mostly consist of people doing speed runs. Even if they don’t say so, that’s what they will do. Many of them will also have speed boosts on their gear so it’s easy to end up running after everyone else through corridors of dead mobs and then seeing the end of quest achievement pop up before you get there. D3 does make everyone zone into boss fights together, so you will at least get to see those. And it’s quick xp. In fact, if you want to level fast when the game goes live, just do co op runs. No one, but no one, is going to enjoy having to deal with lag and server disconnects in the single player game. Guild Wars 2 ran a press beta weekend last week, where press is defined as a mix of fansites and paid press. We’re seeing posts about people’s first reactions now, which are (unsurprisingly, since a large proportion of the players were from fansites) very positive. Initial impressions from betas of long awaited games are often highly positive. People are so happy the game exists at all that they focus on the strengths of the game rather than the weaknesses, and beta players are generally more upbeat and co-operative than players in live games. Sad but true. ArenaNet is giving me everything I want in PvP. I don’t even care about their PvE game anymore. Syncaine is imagining huge PvP-oriented guilds might take over some of the servers and use these mechanics to fight each other when they’re bored of playing EVE (or whichever other game they’re in). I have no idea if any of those things will happen but clearly it has sparked gamer’s imaginations, and encouraged them to start comparing the GW2 setup with games they have played in the past. In Keen’s case that’s the DaoC frontier zones and in Syncaine’s it’s the 0.0 space in EVE. I’ve also seen people compare with the WAR open PvP zones, but they’re less enthusiastic. This is because DaoC and EVE had better PvP setups than WAR so the players who have seen this kind of open zone with objectives work really well in the past are likely to be more positive about it in the future. I just emphasise this to show how our experiences in the past with games affect how we feel about seeing features repeated in future games. What I’m mostly relieved about is that apparently RP servers will be in the same clusters which means it’ll be possible to not have to PvP against the big old school PvP guilds who want to take over entire servers if you don’t want to. My feel for GW2 from the demo I played last year is that it’s still a very themepark type of game, albeit with a heavy emphasis on dynamic events and an unusual class setup. So the best thing to expect would be another evolution on themepark MMO design, rather than something completely different. Ravious, who has been tooting the horn for Arenanet since forever, loved the game and offers to answer people’s questions in comments. Massively has a couple of beta impressions. Mike Fahey at Kotaku describes how he spent an hour trying to fall into a hole and die. I’m sure we’ve all been there (or am I the only one who always tries to jump off high things and die in new games?) It’s a good roundup. For me, while I’m still keen to go play with snow leopard cubs with Arb, I cannot get excited about WvW because I’ve been there before, done that before. On the other hand, the class and group design sounds like a lot of fun. It sounds as though they have some interesting plans for guilds, also. Another thing to note is that several players have commented on how large the world is, but no one has said anything about mounts.